Lots of companies offer a thin patching material, but ChemMasters’ FeatherPatch goes the extra half an inch. Many thin patching materials are limited to 1/2" depth repairs. But FeatherPatch can be placed to a full 1" depth, adding extra versatility to a thin patching mortar with high strength characteristics. Whether you need a repair mortar to replace damaged concrete, want to even out the transition between two substrate levels, create a slope for proper water drainage, or fill in a "bird bath" depression in a floor… that extra half an inch can be invaluable to make sure the job is done and done right. 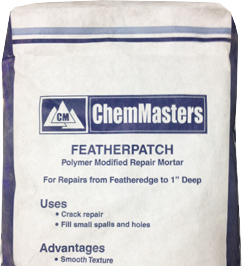 FeatherPatch is a single component, polymer modified repair mortar with excellent abrasion and impact resistance. Its freeze/thaw stable, resistant to deicing chemicals, salts, fertilizers, acids and alkalis; and suitable for both interior and exterior repairs. FeatherPatch has a smooth texture that is easy to finish with a broom, float or trowel. Always remember that thin patching mortars should not be used as overlayments. ChemMasters makes Level Top and Level Top Supreme for those applications. No matter what the need, ChemMasters makes the repair mortar, grout, underlayment and overlayment for the job. Call our Technical Department for information to help you seal the deal! FeatherPatch is a blend of graded quartz, silica sand, cements and proprietary additives. It is a single component, polymer modified mortar, requiring only water for mixing.